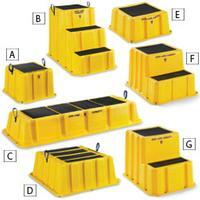 Poly Stepping stands include non-skid abrasive on each step for safe footing. Replaceable rubber feet. Stackable. High-Density polyethylene construction. Color: yellow.